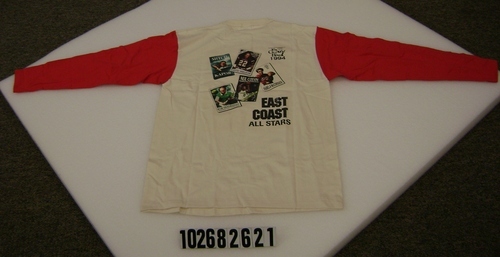 On the back is written "The Computer Bowl 1994, EAST COAST ALL STARS", also depicts five individuals in sports poster format: MITCH KAPOR, DAVID NELSON, BOB FRANKSTON, NEIL COLVIN, PAMELA McCORDUCK. On front, reads "Computer Literacy Bookshops, Inc., The World's Largest Selection of Computer Books, Virginia: Vienna Calif., Sunnyvale, San Jose, Cupertino." 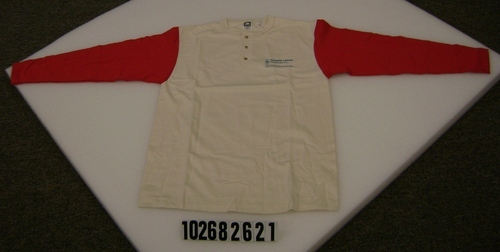 The T-shirt is a long-sleeved one.